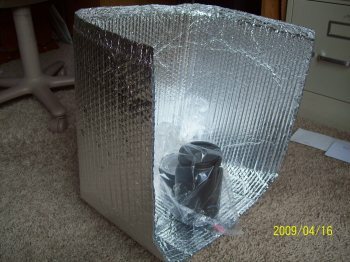 Easy and Cheap...Small, Solar Panel Cooker...For less than $5.00, you can build an effective Solar Panel Cooker that will allow you to cook a small to medium size individual meal, using just the energy of the sun. We use this little panel cooker for our solar cooking classes as a Do-it-yourself project for people to make their own.It really can cook food, albeit in somewhat smaller quantities. The panels and the jar are compact enough to use for backpacking and camping if you like. 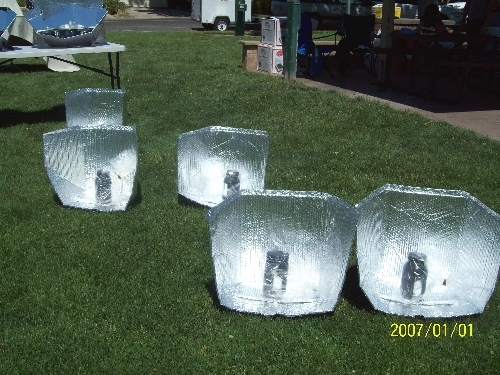 The materials necessary for building your own individual solar panel cooker can be purchased at your local home improvement store such as Home Depot, Lowes or Ace, as well as oven bags and canning jars at your local grocery store or Walmart. 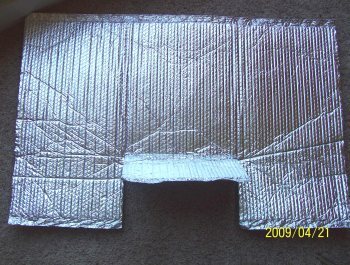 The reflective bubble insulation can be purchased in a roll, (25'x 2') allowing you to make several reflective panels, or you can buy a pre-cut length in some home improvement stores. This particular reflector panel is a 3'x 2' (three by two foot) panel. From both edges, measure in twelve inches and mark with a marker on the edge. From each mark, measure up eight inches. Cut from each edge mark up to the eight inch mark. Fold middle section up to make a flap with crease between the twelve inch marks. Take hold of both remaining twelve inch flaps and draw them inward, toward each other to form a "floor" or "base" which will rest on the ground, enabling the reflective panels to stand up on their own. Clip all three joined flaps with a large paper clip, assuring the flaps remain together. Take your glass canning jar with lid and apply a coat of high temperature BBQ paint in light even coats, making sure not to apply to heavily; causing the paint to run. Let paint dry for a few minutes. 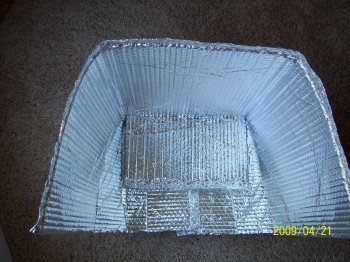 Place blackened canning jar inside of large oven roasting bag and use tie to seal the bag. Stand jar and bag in the middle of the reflector panels in an upright position. You can cook most anything you like inside of the jar, or you may use a larger darkened or black cooking pot inside of your oven bag in order to increase the amount of food to be cooked. 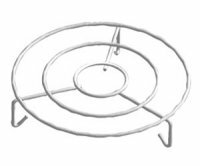 For most efficient heating of your cooking vessel (pot or jar) you can place the jar on a trivet, inside of the oven bag, allowing the suns rays and the hot air to circulate beneath and around the vessel. All you need to do is increase the size of the panel reflectors, enabling the cooker to capture more of the suns ray and concentrating them onto the oven bag and cooking vessel. For example you might cut a four to five foot section of reflective bubble material and measure equal distance from the sides, cutting your flaps and folding into a larger, more effective "sun catcher". Like wise you can increase the height of the panels, making it that much more effective.